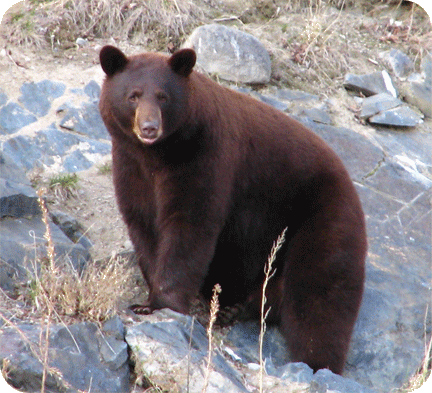 Are you looking for a Black Bear hunting experience of a lifetime? Then you've come to the right place! Our bear populations are very healthy and with thousands of acres of land allocated specifically to Viking Lodge your chances of harvesting that trophy bear are very good. You may also get the chance at a color phase bear. We take our bear hunts very seriously and spend several weeks prior to the season preparing, and we keep a close watch with trail cameras to ensure that the site we put you on has good bear traffic. Most hunters will see numerous bears during their five day hunt and may have more than one opportunity at a good looking one. Our past success rate is 100% with rifle and 95% with bow. Although our Spring and Fall seasons are quite long we only accept hunters in the last two weeks of May and the first week of June for the Spring season and the first three weeks of September for the Fall season. These are our prime hunting times during the seasons. All hunts are over active bait sites with tree stands in place. It is your choice to hunt with bow, rifle, or muzzleloader. All are legal during our bear seasons. We offer hunting packages in both Spring and Fall. © Viking Lodge Ltd 2016. All Rights Reserved.